Gas Water Heaters by Hindware Atlantic offer both high efficiency and superior safety, packed in one magnificent product. Suitable for high & low-pressure installations, Gas Heaters are enabled with 3S optimization which allows you to choose between winter, summer & spring/autumn mode, with respect to your temperature requirements and thus allowing you to select the quantum of heat according to the varied seasons. The Smart LED temperature indicator senses & displays outlet temperature thus making this type of heaters, user-friendly. Manufactured using corrosion-resistant SS body along with triple burner system spread over 245mm distinguishes this best in class product that guarantees high durability & efficient performance. Extremely safe for homes especially with children, Hindware Atlantic Gas Water Heaters prevent Carbon Monoxide build-up & shuts down in case the unit is left on accidentally. The Child Lock Safety Feature safeguards your homes against any accidents. Designed to keep your convenience and safety as the utmost priority, Hindware Atlantic Water Heaters boast of Max 80% heat efficiency giving you more Family-fresh Hot Water in minimum time. 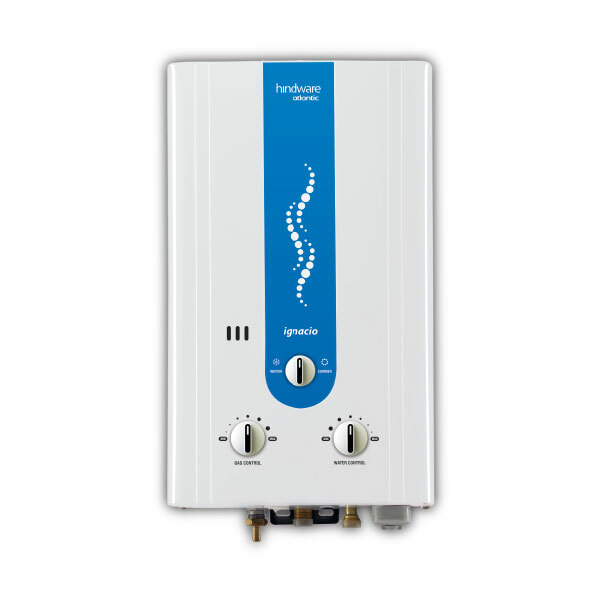 Suitable for both high & low-pressure installations ranging from .1 to 10 bars, Hindware Atlantic Gas Water Heaters can function in a wide range of pressure conditions. The flexibility ensures that our water heaters can work in a range of conditions and you’ll get access to family fresh hot water at all times. As the season changes, your requirement of hot water also changes. At the peak of winter, most of us like super hot water but as the temperature goes up, luke warm water does the job. Our innovative Gas Water Heaters come with 3 S Optimization that allows you to select the temperature as per your preferences. Keeping your convenience and weather changes in mind, this feature is just another attempt in making Hindware Atlantic Gas Water Heaters stand out as compared to others. Hindware Atlantic Gas Water Heaters feature a smart LED temperature indicator that senses & displays outlet water temperature. This way you can monitor the water temperature and know beforehand the exact temperature of the water. This convenient feature makes our water heaters very user-friendly and easy to operate. Hindware Atlantic Gas Water Heaters are crafted using a Rust free SS body along with triple burner system spread over 245 mm for high durability & performance. The anti-corrosion stainless steel body ensures that you get hot water for a long time without much wear and tear. The triple burner system ensures superior performance and fresh hot water every time you turn on the faucet. Gas water heaters are able to provide an unrivaled experience with its hassle-free ignition technology. The auto-ignition instantly ignites the fuel once the water supply has started. When the cold water runs into the water heater when a hot water tap is opened. A sensor detects the water flow that ignites the gas burner to heat the water. The best part about gas heaters are that they’re energy efficient and they never run out of hot water. Copper is efficient in transferring heat from electricity to the water. While designing a heat exchange, one of the most important aspects to be kept in mind is the material of the exchanger. The high thermal capacity of copper allows the heat to pass through it easily. Copper also comes with a host of properties like corrosion resistance, biofouling resistance, tensile strength, specific heat and high melting point, that make it extremely feasible to be used in designing the heat exchanger. Our water heaters assume safety as a high priority. The flame failure technology immediately cuts off the gas in case if the flame gets extinguished. Gas heaters are controlled by an electronic control unit. Temperature, gas flow, modulation and ignition are controlled by the electronic control unit. The flame failure technology comes with a flow sensor to detect any kind of gas leakage. Our water heaters provide with generous supply of hot water at express speed. Classic gas water heaters from Hindware come with the safety of thermal overload protection.This is to prevent the operating of the heater in the event of low pressure of inlet water and high temperature of water. This is a crucial feature that prevents damage to the body of the gas heater. Users can enjoy a care-free experience with our intelligent water heaters. Safety is the most essential feature that one should look for while buying a water heater.